Born in Scotland, Smith emigrated to South Africa and in 1958, studied graphic design at the School of Art in Johannesburg under Joyce Leonard. He lives and works in Onrusrivier, Western Cape. 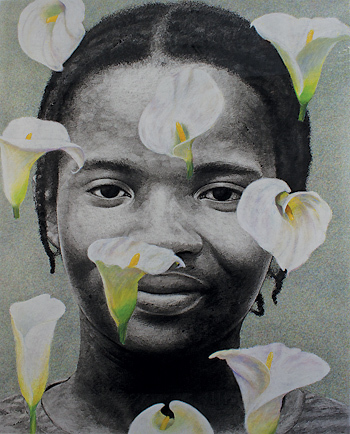 Raymond with arums is a large charcoal portrait of a young journalism student from a town called Zwelihle. As with most of his portraits, he set out to depersonalise them by placing objects on a plane in front of the portrait. The objects, icons or dots are devices by which he 'robs' the portrait of its power, and in most cases they do not necessarily relate to the subject. In the case of Raymond, he used arum lilies as an interference device. They bring an added dimension to the portrait and set up a tension between the two planes.